At the 2017 State Fair of Texas, Nissan unveiled the Armada Platinum Reserve, the new range-topping model in the 2018 Armada lineup, slotting above the Platinum. 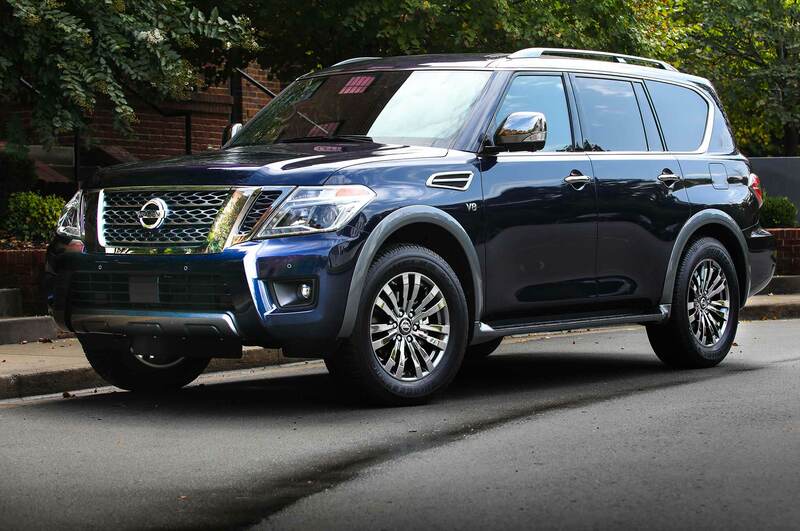 Key differences in the 2018 Nissan Armada Platinum Reserve include dark chrome exterior trim, 20-inch dark chrome alloy wheels, a two-tone leather interior, wood-tone interior trim, and a center console with “Platinum Reserve” embossed in it. Pricing starts at $62,985 including destination for rear-drive models and $65,885 for four-wheel-drive variants. Like the Platinum trim, the Platinum Reserve will come standard with the Intelligent Rearview Mirror that adds a built-in monitor to the rearview mirror that prevents the driver’s vision from getting impeded by tall passengers. Powering the 2018 Nissan Armada Platinum Reserve is a 5.6-liter V-8 with 390 hp and 394 lb-ft of torque that comes paired exclusively to a seven-speed automatic transmission. Fuel economy ratings for the 2018 Armada are 14/19 mpg city/highway for rear-drive models and 13/18 mpg with four-wheel drive. In addition to the 2018 Nissan Armada Platinum Reserve, Nissan will also show the Midnight Editions of the Titan, Titan XD, and the Frontier. The three Midnight Edition models offers unique design cues such as a black grille, dark headlights, black foglight finishers, black side mirrors, step rails and exterior door handles, black rear bumpers, and Midnight Edition floor mats. Exterior color choices for the Midnight Edition Titan, Titan XD, and Frontier include Magnetic Black, Gun Metallic, and Pearl White. Pricing has yet to be announced for the Midnight Edition variants of the Titan, Titan XD, and Frontier.